Many people use Excel for helping them in choosing their daily fantasy lineups. Using Solver in Excel is a great way to help narrow down who you want to choose in your lineups. However Solver can be tricky. Even after using it for a long time, I still run into issues. 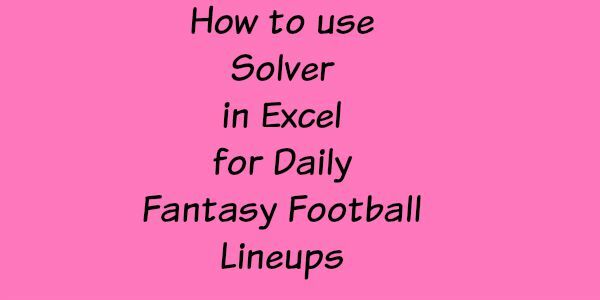 So I made this video on how to use solver to pick your daily fantasy football lineup for Fanduel. This video below will explain how to set up your spreadsheet. Tells you that Solver only looks at the top 200 records so you need to sort them for the best players to be at the top. It shows how to set up the constraints for solver and the type of Solver program to use. While it is similar to the baseball one, it has some differences so please let me know if you run into problems.